Nippon Ichi Software’s The Princess Guide has an intriguing premise. Players control a veteran mercenary who takes on the role of tutor for four young princesses in a fantasy world, guiding them in both combat and general conduct befitting someone of their leadership station. However, the premise turns out being a rather shallow veneer on top of an enjoyable but underwhelming mission-based action RPG that bizarrely decides to try and hide its deeper elements. 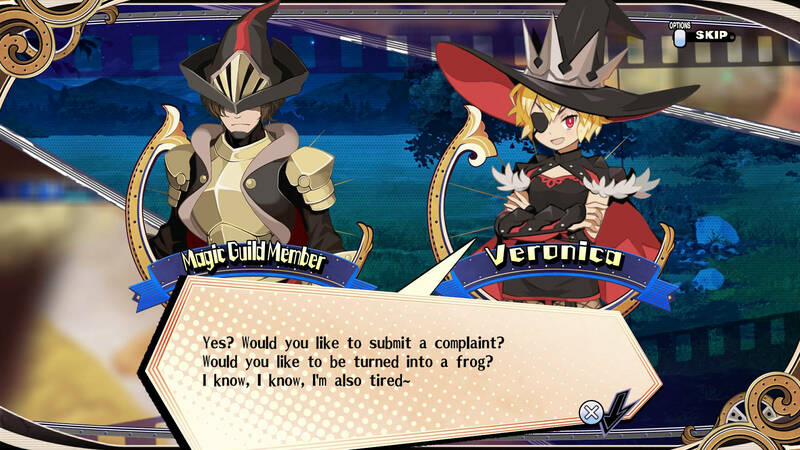 The game starts with players naming a character, followed by an initial story mission, and then the actual customisation of their character, with a limited selection of visual options. The most interesting of the options is a character nature, which promises to have an impact on story elements, though in practice it appears to amount to little more than altered pieces of dialogue scattered around than anything substantial. Players are then asked to choose which of the four princesses they wish to train. This first selection is simply one of order, however, as after completing the initial story mission for the first princess, the player heads off to begin training each of the other three. Following this, players get the actual choice of which princess they wish to follow to the end of their personal story. The princesses’ individual stories are fairly interesting, but there’s not much substance to them. They never venture far from the initial setup, and the threads that try to link them together are tenuous and forgotten about by the time the conclusion comes around. 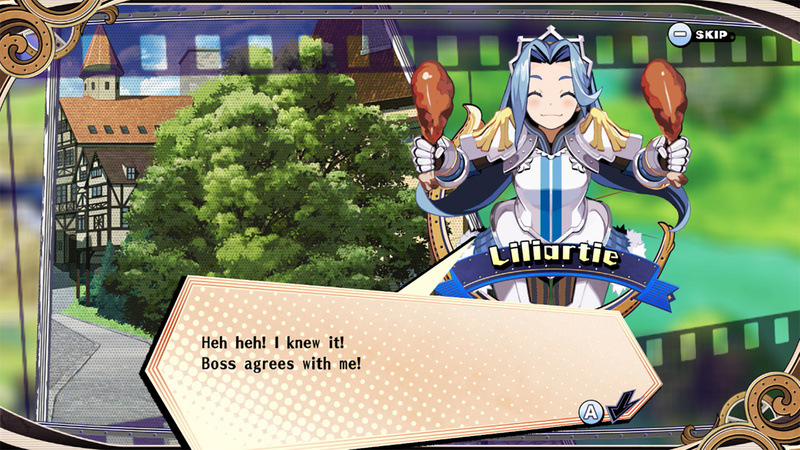 There is at least some fun variety between the princesses’ personalities and NIS America has provided an entertaining localisation that packs it full of jokes and goes some way to papering over the weak narrative and complete failure to use its premise for something more than a framing device. Teaching is more difficult when the student has magic at their disposal. With a single playthrough running at five to eight hours and a New Game+ started by simply loading the completed save, it’s clear that the game wants players to replay it to try and collect all the endings, with each princess getting three endings of varying ratings of “goodness”. However, unless one were to research the game beforehand, there’s nothing to actually indicate their existence, let alone what might be required to obtain those better endings. This inability to explain its ideas is a running theme throughout the game as most of its depth goes completely unexplained. For example, each princess has a series of attributes that can be leveled up, but at no point is there any indication of what any of these attributes might actually do. Though it doesn’t explain anything else, The Princess Guide at least does the courtesy of walking players through its basic controls in the opening tutorial missions. 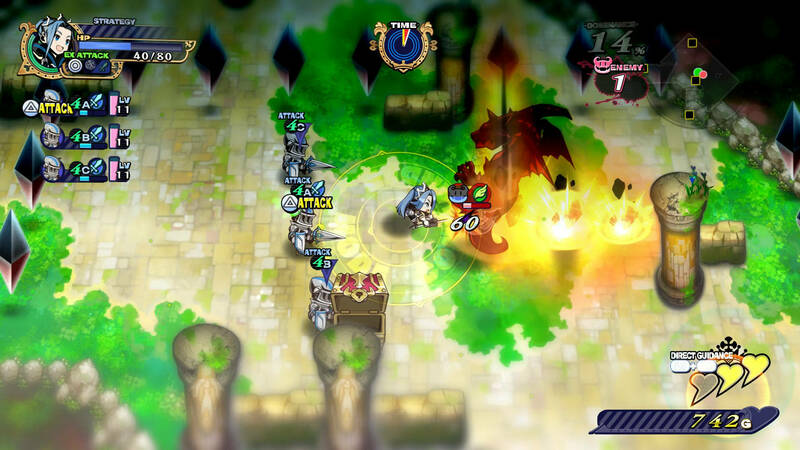 Players control a commander, usually either their character or a princess, who is accompanied by a selection of other troops. There are straightforward button presses for regular and special attacks, however, there is no dodge or block option so players have to choose between all-out offense or a hit-and-run approach. The commander can switch between a command mode, where the troops strictly follow the commander and provide some direct control abilities, and a free mode where the regular troops will be more proactive in attacking enemies. While in command mode, players can also capture and utilise traps, which can be useful to hurt enemies, but more importantly doing so stops said traps from hurting the player in a game where healing options are limited. When controlling the guided princess, players also have the option to scold or praise them up to three times per encounter, which provides some occasionally vital extra healing options and can even be used for a resurrection. There are also some other bonuses that it can grant, but these are obscure at best. For regular troops, special commands can be given, but again it’s all trial-and-error on the player’s part for determining if one of these instructions will provide any significant help. There’s little punishment for falling in battle as players can restart from the beginning of that particular area in encounter or restart the overall mission. There is no autosave, however, so players should still save frequently in case of any potential issues. The Princess Guide has some appeal in its combat, which is quick and enjoyably straightforward for the most part, but it’s not strong enough to maintain a lasting interest and becomes highly repetitive. Between encounters, players find themselves on a world map made up of generic nodes, sending commanders between these nodes to the next mission. Enemies will also wander around the map, but there’s no actual strategy that needs to be employed to deal with them; these enemies don’t do anything in the world map other than start battles with commanders that run into them. This makes what might otherwise be a tactical consideration in the admittedly-generous limit on how long commanders can venture away from the home base for, as well as the demand of a rest period when they do withdraw and restrictions on things like changing weapons, utterly pointless. Players can recruit additional commanders and squads, though in practice there is zero need to as a princess and player character will be more than enough to deal with any available missions and encounters. Different types of troops can be chosen to accompany the commander, though options are very limited for everyone except the player character. These troops can also level up, but like other aspects of the game, there is no indication of what these levels do. Commanders can change their weapon at the home base, which is the only obvious way to enhance the player-controlled characters. Weapons are dropped frequently, but many of these just serve to populate a list or to be sold for paltry sums of money that has little use in the game anyway. There are weapon upgrade and item creation mechanics, but these are held back but both the game’s general obscuring of anything that adds depth and no real need to use them. Though the praising and scolding mechanic is there, The Princess Guide’s failure to do something more substantial with its premise is a great disappointment. At a select few points in conversation there are options for a more narrative praise or scold, but the only apparent result of these is to fill up a meter that rewards the princess with a materia that can be applied to raise those nebulous attributes mentioned above. However, other than that the actual guiding of the princesses is woefully absent and just furthers the underlying disappointment in the title. The animations of conversations are initially a little off-putting as the characters all bounce around excitedly when talking, though it doesn’t take too long to get used to, and it strangely ends up working with the princesses’ generally bouncy natures. The general aesthetic is quite charming and used effectively, though the combat arenas all blend into each other and the node format of the world map leaves very little of interest. The Japanese voice acting and music are perfectly serviceable, but both are immediately forgettable. The Princess Guide provides some moments of enjoyment, but overall the game does very little to endear the player. It feels like the game goes out of its way to obscure anything that might add depth, while some amusing conversations can only distract momentarily from the egregious waste of its premise. Though The Princess Guide at least avoids some of the pitfalls of frustration, it simply doesn’t have have much to recommend it. Seems to be a recurring problem with NIS’ recent non-Disgaea games. Ooh, we have all these deep elements but we’re going to make them obtuse and fail to provide documentation. Y’ain’t From Software, doods.